Web Site ?Copyright 2001-2016 by Carol Goldberg, Ph.D. Web Sites and Sound Bites? is a Registered Service Mark with the U.S. Patent and Trademark Office. All rights reserved. Sound bites are short, clever, memorable phrases (for purists, of about 20 seconds duration). They are time-savers media love to quote. Busy people value their precious time. They want quick, clear, concise, and easy to remember. "a picture worth a thousand words"
To illustrate, here are some sound bites Dr. Goldberg wrote, which are displayed on this site, including under the menu at the left of each page. You can afford to let people know about your work, but can't afford not to. Unless you publicize your work, you will be out of work. To stand out from the crowd, you have to show why you are outstanding. The best time to do something is before you have to. We can help you reach and teach professionals with online continuing ed. You can expand your work and their world through distance learning. A sample is the best example. The time to get ready for an opportunity is before it happens. If you want to earn more, you have to show why you are worth more. If you don't find opportunities, opportunities won't find you. Our work thrives on making your work thrive. Fear of terrorism has more victims than a terrorist act. My own definition of terrorism is psychological warfare. 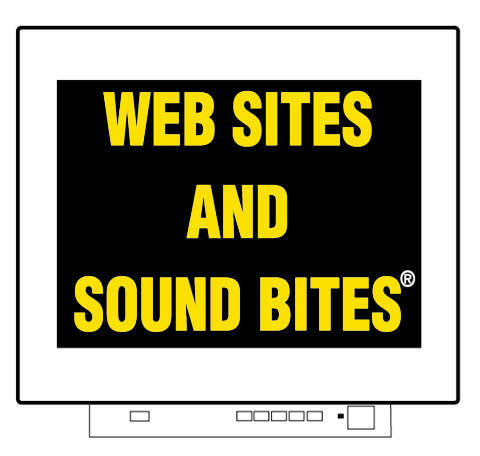 Web Sites and Sound Bites?knows how to write for web sites and media.